How about this? 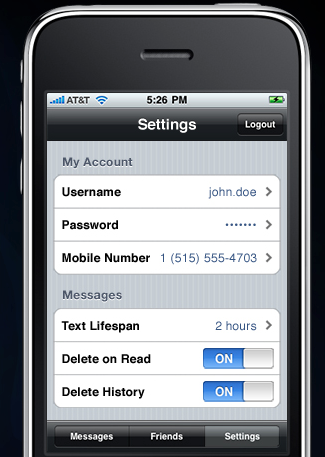 – A text message that expires on both your phone and the receiver’s device as well. Sounds cool, right? The patent-pending technology was announced recently by a company called X Sigma partners and is currently available at the Apps Store. But soon, it will also be available for BlackBerry and Android devices. TigerText lets you send text messages that delete off on your phone and the receiver of your text messages after a set period of time. The text messages that you sent disappears from the phones and are not stored on any server. That means that you can’t retrieve the text messages anymore after it’s lifespan expires. It practically answers your need to keep your text messages private. I mean, you can even set the lifespan of your text into as less as one minute, well if you think that it’s enough time for your recipient to read your text, why not? Talk about giving you peace of mind, right? The TigerText app also features an easy-to-use interface, making sure that you don’t have to learn another set of new applications methodology. It’s similar to the text messaging app of your iPhone. The app is available now from the Apps Store for free. If you use it now, the first 100 messages that you will send or the first 15 days of your usage will be free. After that, it will cost you $1.49 per month for every 250 text messages. Or if you want unlimited texting, you can opt to pay $2.49 per month.